On May 28, the people of B.C. gave my government a renewed mandate. And they sent us some very clear messages -- messages that we intend to act on. People have told me they want to see health care and education protected. They want us to continue to invest in young people and jobs. This budget delivers on all counts. And it helps out B.C. families and small business with income tax cuts, a tax freeze until the year 2000, and freezes in BC Hydro rates, tuition fees and ICBC car insurance rates. British Columbians have also told me they want us to cut the cost of government and reduce government debt. We're listening. In our first term, we tackled British Columbia's $2.4-billion deficit. Now we take on the challenge of reducing B.C. 's provincial debt. You deserve a government that listens to you and acts on your priorities. Delivering that government is my commitment to you as premier. I am pleased to introduce my first budget to the people of British Columbia. It is a budget that builds on the financial strength of B.C. -- having the best credit rating and lowest debt per capita of any province -- with further measures to improve services while cutting costs. It does this through a leaner, but not meaner, approach that provides a greater commitment to protect health care and education than any other government in the country. And it is a budget that responds to the concerns raised by British Columbians to act on government debt with a moratorium on capital spending and a comprehensive program review. The 1996 budget strikes a balance between service delivery and solid financial management. And it responds to the concerns raised by British Columbians during the election campaign. Cutting the number of ministries from 18 to 15 -- the smallest number in over 35 years. Cutting spending in two-thirds of government ministries, to focus resources on priorities like health care and education. Eliminating two Crown corporations -- BC Systems Corporation and BC Trade -- saving taxpayers $71 million a year. No wage increase this year for government employees. Reducing welfare caseloads -- May figures show that caseloads are down by 12,000 cases from the same time last year. The 1996 budget ensures that B.C. will continue to have the top provincial credit rating, lowest debt service costs, and the lowest per capita debt in the country. B.C. will have a surplus of $87 million this year. Revenues for the next year will be up 2.6 per cent to $20.7 billion. Spending is estimated to be $20.6 billion, up 2.1 per cent -- half the rate of inflation and population growth. On July 1, the provincial personal income tax rate will be cut by one point and by a second point in 1997. The reduction is capped for taxpayers earning more than $80,000. The budget also increases the threshold for the property transfer tax so that more first-time home buyers will be exempt from the tax -- saving them up to $3,500. New legislation freezes taxes and prohibits any new taxes on individuals and families to the year 2000. BC Hydro residential rates are frozen for three years. ICBC rates are frozen for two years. On July 1, 1996, the small business income tax rate is cut by 10 per cent. Combined, these measures will save small businesses $29 million a year. Total government debt will decline by $99 million this year. Direct debt will fall by $53 million. B.C. 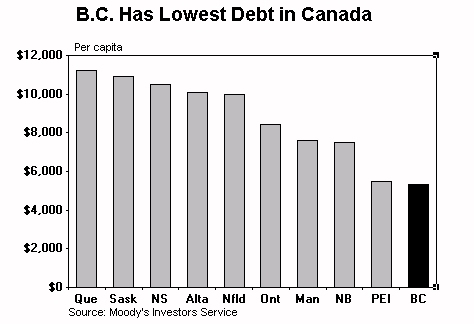 's debt servicing costs are less than 8 cents for every dollar of revenue Ñ the lowest in Canada. The debt management plan will eliminate the government's direct debt over 20 years. B.C. 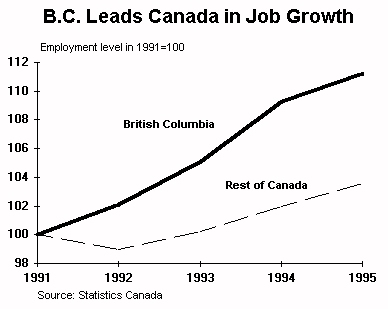 -- Canada's strongest economy -- has created 177,000 new jobs since 1992, and will create another 40,000 jobs this year. Special efforts will be made to protect the B.C. salmon fishery, coastal communities and related jobs. 21,000 more forest sector jobs in partnership with the industry. Through this partnership, B.C. will get more value and jobs from every tree cut in the province. A new partnership with the tourism industry that will help create 23,000 new jobs in that sector over the next five years. Establishing a major crime investigation unit, in co-operation with the RCMP, to investigate unsolved murders and other crimes, using advanced technology such as DNA fingerprinting. Fighting prostitution, getting tough on the pimps who profit from prostitution and the johns who keep it going. Getting young people off the streets, providing them with positive alternatives to violence and crime. The Nights Alive initiative operates in 20 communities across the province. It uses school and recreational centres after hours for sports, arts, music, and other activities chosen and organized by local youth. Tuition freeze -- the government is helping to keep post-secondary education affordable by freezing post-secondary tuition fees for two years. Access to spaces -- the government is guaranteeing post-secondary spaces for every qualified student, creating 7,000 new spaces this year. Access to jobs -- the Guarantee for Youth is creating 11,500 job opportunities in partnership with the private sector. The B.C. government is making the strongest commitment of any provincial government to ensure that health care and education are protected. Providing new funding to reduce waiting lists for heart surgery, cancer treatment, and hip and knee replacement surgery. Ensuring health care spending reflects population growth and cost pressures. Establishing a new B.C. Health Care Scholarship so health care workers can upgrade their skills. The scholarship will help 300 eligible health care workers with an annual scholarship valued at $3,500, to a maximum of four years. Protecting funding for students in special education, aboriginal education, school meal and inner city school programs.